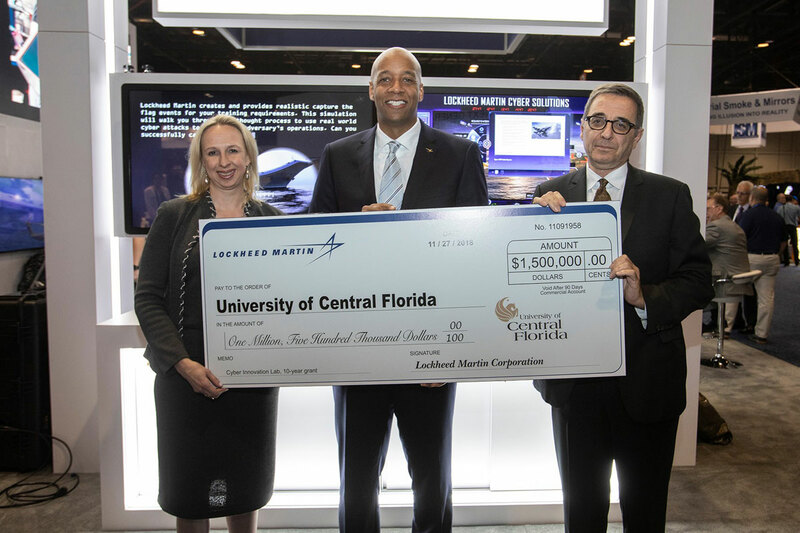 Lockheed Martin today announced a $1.5 million contribution to UCF for the development of a new cyber innovation lab that will foster the next generation of cyber talent. The Lockheed Martin Cyber Innovation Lab will help ensure UCF remains on the forefront of educating and empowering the nation’s future cyber experts, and will expand UCF’s established strength in cyber defense education and research. The 970-square-foot lab, which will be located in the atrium of UCF’s Engineering I building, will serve as a learning hub, classroom, and the practice center for UCF’s Cyber Defense Club. It is expected to open in early 2019. UCF provides more graduates to aerospace and defense companies than any other university in the country, and UCF continues to grow cyber research and education through its Cyber Security and Privacy Faculty Cluster, an interdisciplinary research team focused on comprehensive solutions to human and technological causes of security and privacy problems. UCF rose to national prominence in cyber defense when its homegrown Cyber Defense Club won three back-to-back championships in the National Collegiate Cyber Defense Competition in 2014, 2015 and 2016. The competition is sponsored in part by Raytheon and the National Security Agency. The student club, with more than 350 members, continues to dominate in collegiate competitions throughout the country. In 2016, UCF was named as a National Center of Academic Excellence in Cyber Defense Education by the National Security Agency and the U.S. Department of Homeland Security. The designation, which brings prestige and additional access to scholarships and research grants to UCF, comes under a federal program that’s meant to reduce the vulnerability of the nation’s infrastructure by strengthening higher education and research in cyber defense. According to a recent study published by the National Institute of Standards and Technology, the United States has a dangerous shortage of cybersecurity workers, with more than 13,000 unfilled cybersecurity jobs in Florida alone. The Bureau of Labor Statistics expects jobs for information security analysts to grow by 28 percent by 2026, four times greater than average job growth. Florida is one of the top five states nationally for information security employment. 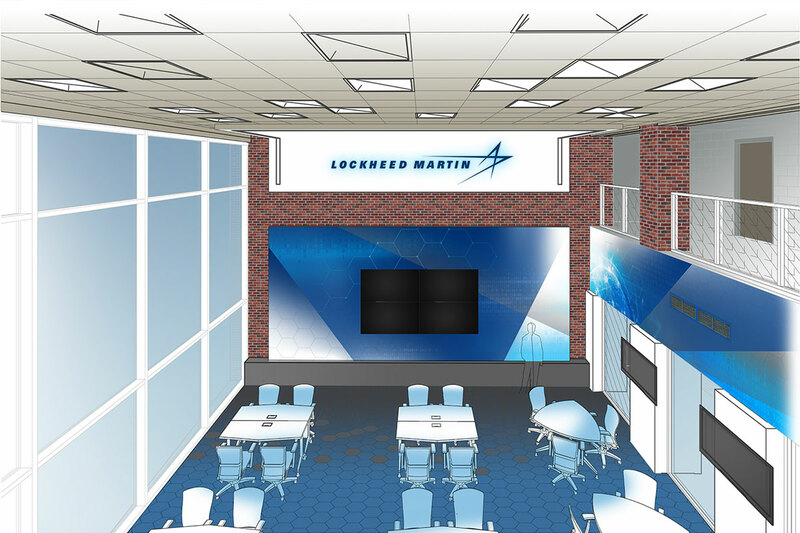 Lockheed Martin’s Cyber Solutions business in Orlando has grown by 400 percent over the past five years and continues to grow in response to the nation’s critical need for offensive and defensive cybersecurity capabilities in today’s evolving threat environment. 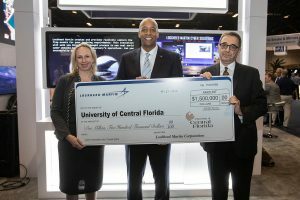 Pictured: Lockheed Martin’s Amy Gowder and Tom Warner present a check for a new Cyber Innovation Lab to Michael Georgiopoulos, dean of the UCF College of Engineering and Computer Science.